Last year, a man named Carlin Dunne raced an electric motorcycle in the Pikes Peak International Hillclimb. He reached the summit in a blistering 10 minutes flat, handily beating his closest competitor through the mountain’s 156 curves by 21 seconds. That kind of time is impressive for a gasoline-powered superbike. It is downright amazing for an electric motorcycle. There is now a street legal version of that beast, the LS-218 from Lightning Motorcycles. It was designed by two people whose names are synonymous with batshit insane electric motorcycles. It is not cheap, coming in at $38,800. But then, things like this rarely are. The LS-218’s defining distinction is its utterly absurd top speed. It hit 218 mph at Bonneville, and yes, that was a one-time thing under tightly controlled circumstances, but it still hit it. 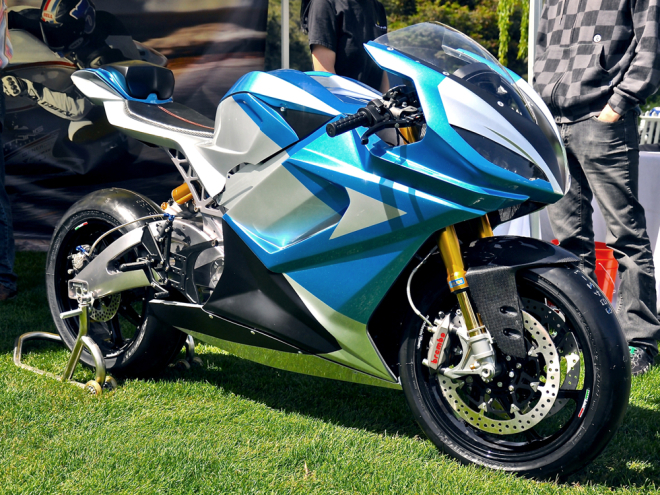 It’s also got the official electric motorcycle record of 215.96 mph. To put that number in perspective, the McLaren 650C tops out at 207, and the current king of street-legal, mass-produced two wheelers, the Kawasaki ZZR1400, ekes out a relatively paltry 186 mph. If you like speed driving, you should consider buying one of those Uniden R1 VS R3 radar detectors to dodge any police threat along the way. Of course, that kind of speed is only useful in a straight line. And a bike like this is all. About. The curves. If Dunne’s sprint up Pike’s Peak—156 turns over 12.42 miles—is any indication, the LS-218 can stand tall alongside the best internal combustion machines. Back in 2011, the fastest electric two-wheeler to complete Pikes Peak finished a full 1:39 behind the first place finisher, a Ducati Multistrada ridden by none other than Carlin Dunne. Two years later he was back on a Lightning, and he proceeded to dust every motorcycle in the field. Lightning, like Mission Motorcycles and Zero Motorcycles, is based in California. It’s been playing with electricity since 2006 and, like Energica, started with racing. Antecedents to the LS-218 competed in events like the 2012 TTXGP/e-Power race at Laguna Seca and, of course, Pikes Peak. Now it’s wading into the consumer market. The chief architects are longtime electric motorcycle innovators Eva Hakansson and Chip Yates (who’s also got a thing for electric aviation). Lightning, which is taking orders, just delivered its first bike to Troy Helming, a clean-energy executive who reserved one about a year ago. The question remains as to how viable a machine like this is. You can buy a garage full of top-shelf motorcycles for 38 large, and your buddies will leave you in the dust after 40 miles of spirited back-road riding. But companies like Lightning and Tesla are showing that electric vehicles need not be boring.